Located in a modern building with a great location at only 100m from Sagrada Familia, Gaudi's most important work. There are five different apartments in this same category, one on each floor. 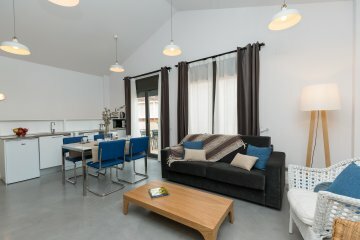 This two bedroom long term rental in Barcelona is very quiet, both bedrooms have windows and go into the indoor court. One of the bedroom has queen size bed and the second one has twin beds, both have closet to hang your clothes. The full private bathroom with large shower is between the two bedrooms. 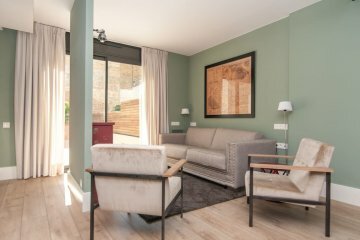 From the cosy living room you can enjoy Sagrada Familia views while resting on the comfortable sofa. The modern kitchen is opened and fully equipped for cooking any meal you feel like. Other facilities included in the apartment: International TV, wifi and air conditioning in the whole apartment. These apartments in Barcelona near Sagrada Familia are available for monthly rentals and price includes utilities and a weekly cleaning.